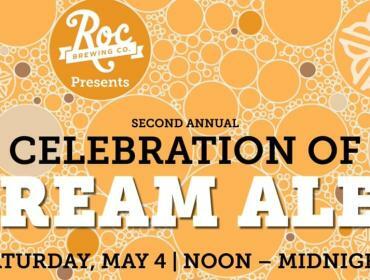 Roc Brewing Co., LLC in 2011 was one of the first breweries to hit the growing Rochester brewing scene. Come check out the taproom and production facility in the heart of downtown. Cheers to all of our friends and supporter, we look forward to serving everyone a pint or two and a memorable experience. RBC features 7 beer taps, rotating on a regular basis. So stop in often to see what’s “on-tap”. We serve NYS cider, and a selection of wine and soft drinks. There is a limited menu for a quick bite. Whether you’re on a NY craft beer bus tour, craft beer enthusiast traveling through Rochester or one of the many craft beer drinkers in Upstate, we would be delighted to host you in the taproom at 56 S. Union Street.